Researchers say the robot’s motor functions have been almost fully compromised by its cancer, which they speculate is probably fairly meaningful in some scientific sense. 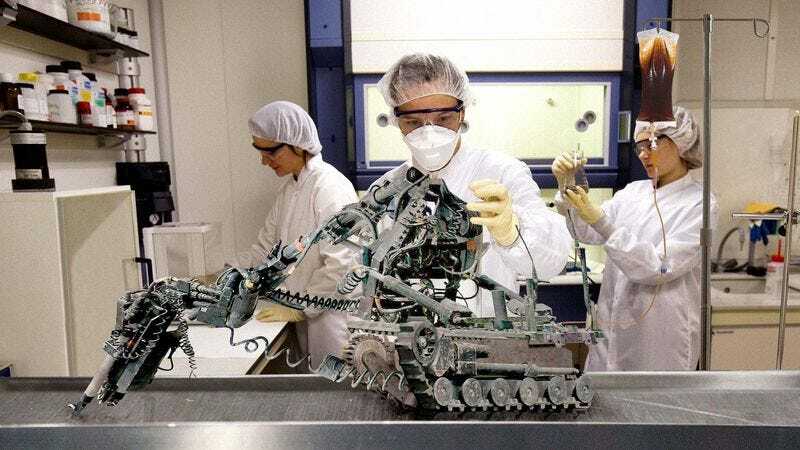 STANFORD, CA—Theorizing that their work most likely represents a groundbreaking scientific achievement of some kind, researchers at Stanford University announced Thursday that they have made an unclear breakthrough by giving a robot cancer. Additionally, sources confirmed that the rapidly proliferating disease had degraded the integrity of the unit’s electrical wiring by 70 percent, with Cruise asserting that, while such a development didn’t immediately suggest any practical applications for cancer treatment, it certainly seemed like something worth noting. He added that initial tests have revealed that the robot’s cancer is inoperable, which he stressed was probably a pretty meaningful detail as well. “Maybe if we can build a robot that already has cancer, it could…” he added, before trailing off. When reached for further comment, Stanford’s research team confirmed that, in what just has to be a crucial finding for artificial intelligence or possibly a related field, they have determined that the robot is fully aware it has cancer and is in constant pain.